Tear gas disperses Sao Paulo protests Jump to media player Brazilian riot police use tear gas to disperse protesters in Sao Paulo three days ahead of the World Cup opening match. Passenger: 'We heard explosions' Jump to media player A passenger at Karachi airport has described the moment gunmen took over the building, killing 11 people. The 2014 World Cup in numbers Jump to media player Peter Okwoche looks at some of the facts and figures that make up the 2014 football World Cup. 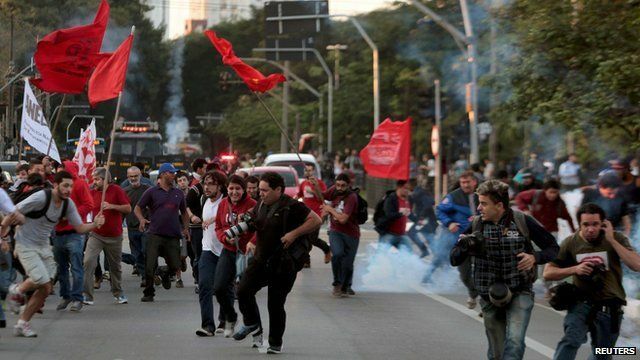 Brazil clashes amid renewed strikes Jump to media player Police in Brazil have used tear gas to break up protesters on the second day of a metro strike that has left Sao Paulo's transport in chaos. Last minute test at World Cup venue Jump to media player Officials in Sao Paulo have held a second "test" game at the city's World Cup stadium with less than two weeks until it is due to host the opening game. 300 families evicted in Sao Paulo Jump to media player Nearly 300 families were evicted on Thursday from the land they had occupied in the Brazilian city of Sao Paulo. Anti-World Cup protesters march Jump to media player Hundreds of demonstrators have taken to the streets of Sao Paulo, in the latest show of opposition to the World Cup in Brazil. Brazilian riot police have used tear gas against protesters in Sao Paulo, three days before the World Cup opening game in the city's main stadium. The BBC's Katy Watson said various demonstrations have been putting pressure on the government ahead of the tournament.